Are you looking for a gift for a Christian man? If so, you’re in the right place. Shopping can be really time-consuming so I decided to compile a list of the best Christian gifts for men. I can’t tell you how many hours I’ve spent scouring the internet looking for the best Christian gifts for men. I decided to list Christian specific gifts because it seems harder to find them. I usually have no problem finding a gift that is non-Christian. My husband is pretty specific about what he wants but there have been multiple occasions that I’ve felt like getting him a Christian gift for no specific reason. Hopefully, this list can help you find a Christian gift that fits your needs. The nice thing is that these Christian gifts for men can work for any occasion. 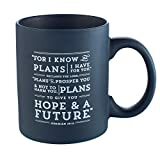 I love mugs with scripture on them. This mug comes with a gift box. It’s made of durable stoneware and finished with a matte exterior and a high gloss interior. 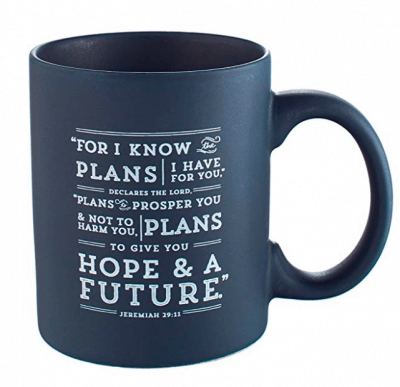 This mug has a deep blue coloring and displays the quote from Jeremiah 29:11. It can hold up to 13 ounces of liquid. 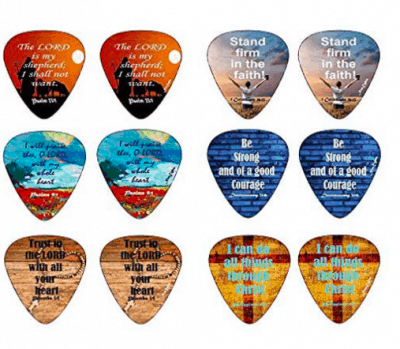 These Christian guitar picks are awesome! They are good quality and have bible verses on them. You could even make two gifts out these guitar picks. The package contains 12 pieces of picks – 6 designs, two pieces each. A perfect encouragement for that special someone to create wonderful music. They are expertly made and durable, medium size 0.71mm. They work perfectly for both electric and acoustic guitars or even the bass. 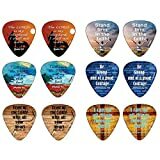 Christian guitar picks with inspiring message inscribed in it that will surely encourage you to create wonderful music. Cool and uplifting messages to encourage yourself, your friends, and your loved one. They are expertly made and durable - Medium Size 0.71mm - Perfect for both electric and acoustic guitars - even the bass. Assorted picks in the package - Great selection to choose from. Contains 12 pieces of picks - 6 designs , two pcs each. Consumer protection - comes with 60 days money back warranty! My hubby loves to have a nice journal. He takes so many notes and he likes to keep them in a nice place. 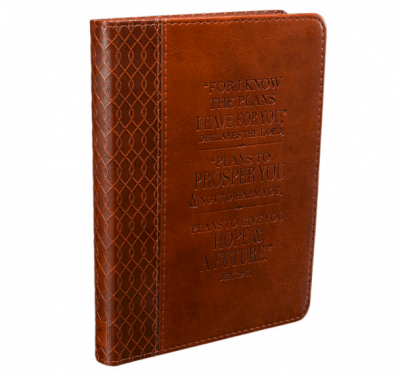 The scripture from Jeremiah 29:11 is nicely engraved onto the front of this journal. 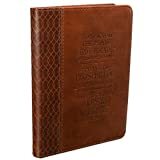 The journal cover is made of a quality man-made material that was imported from Italy, with the look and feel of real leather. A knife is a must-have for any man. 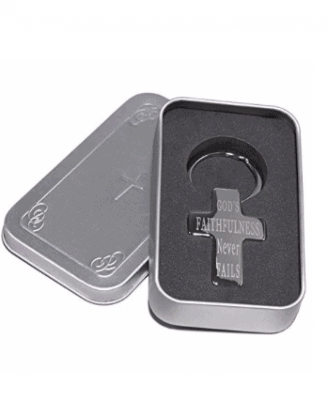 This one is especially nice with Psalm 28:7 engraved on it. 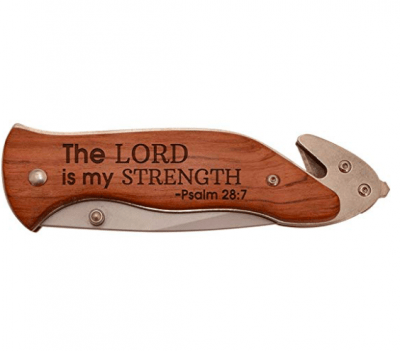 It has a laser engraved rosewood handle and the durable bead blasted stainless steel create a lasting design that can handle any job you tackle. Every piece of wood is unique to the final engraved product may be slightly lighter or darker than pictured. It features a strong 3″ stainless steel blade with a partially serrated edge. The closed length is 5″, and the open length is 8-1/4″. A thoughtful gift with an inspirational message. A handsome laser engraved rosewood handle and durable bead blasted stainless steel create a lasting design that can handle any job you tackle. Because every piece of wood is unique, the final engraved product may be slightly lighter or darker than pictured. Strong 3" stainless steel blade with partially serrated edge. Closed length is 5", open length is 8-1/4". Easy-open thumb flip allows for one-handed use. You can be confident using this lockback knife. Engraving color may vary slightly, as each piece of wood is unique. Includes a practical nylon pouch with belt loop so your knife will always be at your side. 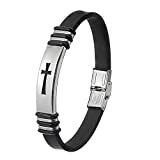 This cross wristband is perfect for the man who likes jewelry. It comes with a little black gift bag. 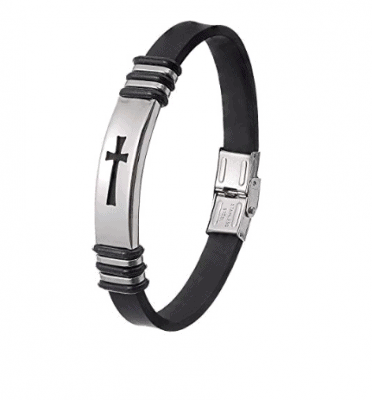 The bracelet is made with stainless steel and is a perfect way to share your faith. QUALITY: Fervent uses the best materials, strongest chains, purest metals and premium coatings / platings to ensure that your jewelry endures. STYLE: Your in the latest "Designed in USA" jewelry pieces on the market - designed to be fahionable, but also timeless! WARRANTY: All customers are entitled to a 90 Day Money Back Guarantee - we love that you choose Fervent and we promise 5-Star customer service & quick response when you contact us. FAST SHIPPING: Fervent utilizes Amazon's facilities, so that you can buy with Amazon Prime! Take advantage of this top of class logistics and shipping option - perfect for last minute gifts like durign Christmas, for Birthdays, Graduations, Anniversaries, etc. GIFTS: Fervent includes a luxurious jet-black gift bag with every item, so that you can easily present it as a present to a special family member, friend or loved one for any occasion. 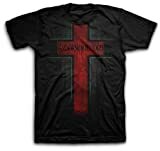 I love expressing my faith through my clothing. This shirt is a great representation of who gives us salvation. 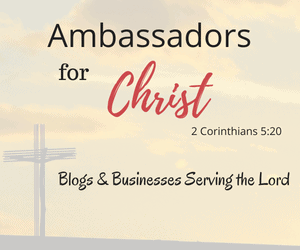 It’s a great way to open the door to conversation about Christ. Help share this promise from Christ with a bold and beautiful testament to all. This is a great simple and inexpensive gift idea. 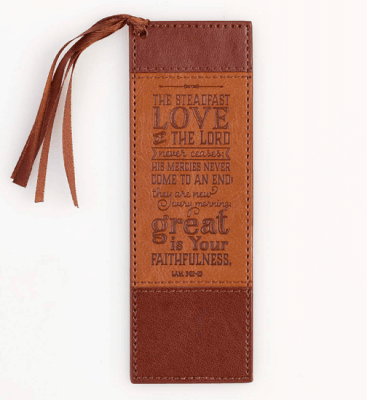 The scripture from Lamentations 3:22-23 is artistically debossed onto the brown and tan faux leather pagemarker. It’s made from a quality man-made material with the look and feel of real leather (trade name LuxLeather). 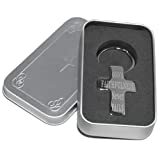 This cross keyring comes in its own little tin gift box. I love the message on this keyring. It’s so awesome to be reminded of God’s faithfulness every time you pick up your keys. These are all the Christian gifts for men that we love! 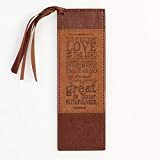 I left some direct links below of more Christian gift ideas. Hopefully, this has helped you narrow down a gift for that special Christian man. Do you have any Christian gifts for men that you want to share? I’d love to hear about them!